Faslane, 25 miles from Glasgow, is one of the two primary sites that constitute HM Naval Base Clyde, the naval services’ headquarters in Scotland. 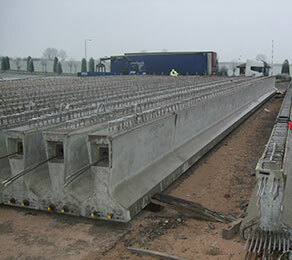 CCL was commissioned to undertake the post-tensioning work for the precast concrete-beam viaduct. Primarily a submarine base, Faslane’s facilities have been upgraded over the last two years to enable a new class of submarine to dock. CCL was commissioned by ABM Precon Ltd to supply materials, and stress and grout 66 precast, pre-stressed, post-tensioned beams, each 26 metres long. The beams formed the new six-span, curved viaduct. the company requested that CCL undertake the full post-tensioning operation, including the stressing and grouting works. The project involved the supply of CCL’s XM range multi-strand bonded system, which was one of the first in the UK to become ETAG approved.